When were their first engines built and in what year did they stopped building engines. As the owner of a 5hp side shaft Jacobson built engine I was not able to find much discussion on SmokStak about Jacobson engines. I'm even considering initiating another registry if you guys have pictures and data on your Jacobson to contribute to the project. The highest serial number I've seen is 16656 so it is not a common engine but not that rare either. I did not know that Jacobson moved to Titusville. I believe Don Worley does do the Jacobson thing. I always wondered why some either had the short fluted hopper and some taller and some vertical and horizontal governors. Ive seen them both ways and mixed. I believe Don Worley does do the Jacobson thing. I found and looked at the Jacobson web site by Don Worley. Mr Worley is probably the most knowledgeable person when it comes to Jacobson engines. Unfortunately I did not find many answers to my questions on his web site. 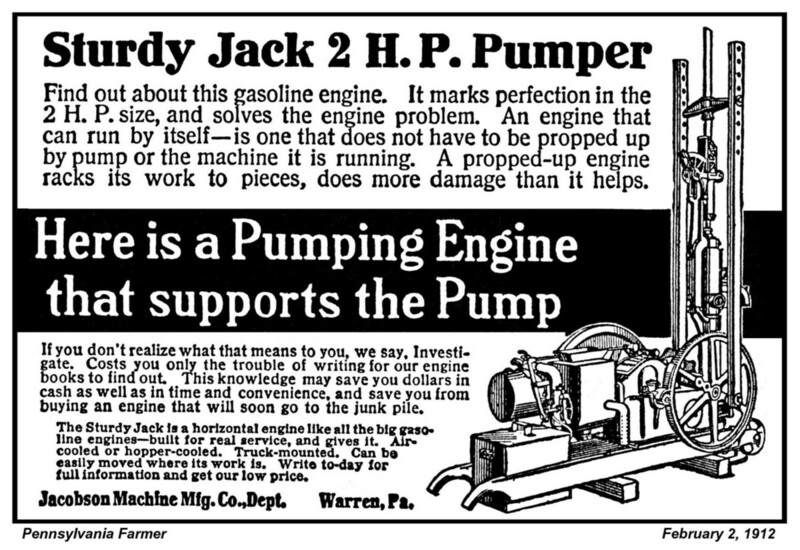 I think that a Jacobson engine registry along with dated magazine ads with teach us a lot about these great engines. Your help is required for this project. I can't do it alone as I only have one Jacobson engine. To all Jacobson owners, feel free to call me 814-730-4183 or email at worley@westpa.net. The Warren Plant burned down in 1923 and the owners of the engine part of he business moved to a vacant plant in Titusville Pa shortly after in 1923. Very few engine were made there. I have factory records from Titusville with some serial numbers. There were about 13000 engines made. Around the time of the move to Titusville the serial numbers were no longer sequential and went as high as 19000 although only around a hundred engines were made. 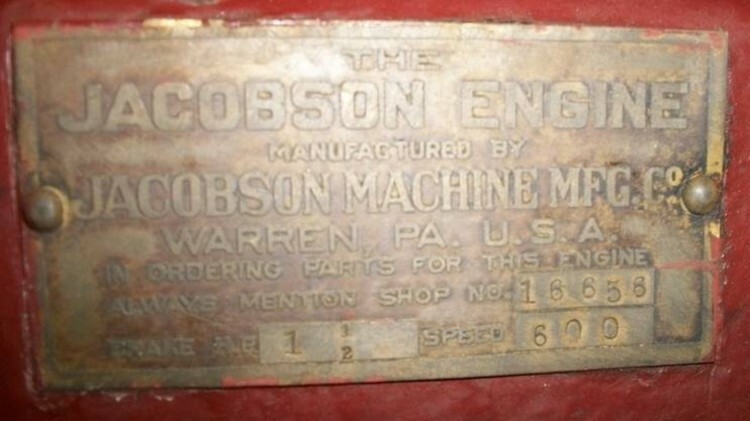 The Warren engines serial numbers ended in the 13000s. Left over parts and tags were used at Titusville. Later they did get some tags made. Years ago a lot of the unused tags were sold. Barnhart-Davis bought the remaining parts and sold them an repaired the engines until the late 60s. Don, what is the lowest serial number you have seen or know about on a Jacobson built in Warren? Someone has a 10hp headless, tank cooled with the serial #1820. Can you venture a guess as to the year that engine was made? There presently are only 5 engines in it but with you help it can rapidly grow to over 100 engines. 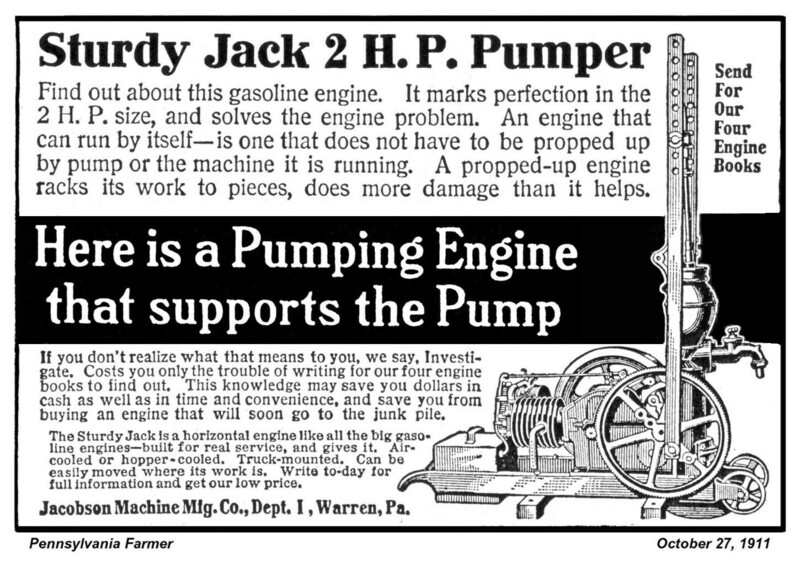 Here are 2 ads about Jacobson's 2hp Sturdy Jack pumping engines. I would like to add a few of them to the Jacobson registry and see where they fit in time. I'm looking forward to add your Sturdy Jack to the registry along with the other Jacobson side shaft engines. I still have not been able to determine in what year the Jacobson Machine Mfg. 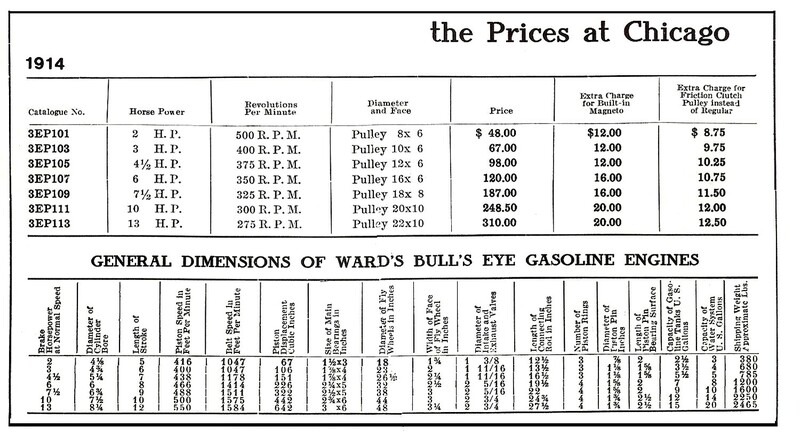 Co., engines were first put on the market. Anyone knows? Attached is the oldest Jacobson ad I have (January 12, 1906) and it is from a selling agent in Batavia N.Y.
Leonard owns this Jacobson and he is here on Smokstak. Thanks for the compliments, this is my pride and joy. The saw is unchanged from the way I found it, minus a bunch of greasy, dirty sawdust. I purchased it from the grand-daughter of the original owner, she said that her grandfather used it to cut siding for buildings around the small town where he lived. It had a pretty extensive crack in the head that I repaired, hence the new paint. I had the original blade sharpened and ripped some boards with it, not fast but it chews thru wood pretty well. It does put a lot of sawdust all over the engine, no sign of shields anywhere. All times are GMT -4. The time now is 06:05:35 AM.